Small businesses such as coffee shops, local restaurants, or sandwich stores simply don't have the time to even think about marketing their brand or developing an effective loyalty program. Digital stamp cards reduce the barriers to entry into mobile and have provided businesses with the brand exposure that is necessary to win customers in today's society. Propel your business & increase sales today! Open the demo link on your mobile phone for the best demo experience. Click on the demo button below. This demo works best on a mobile device. Enter your name into the form to generate your digital stamp card. 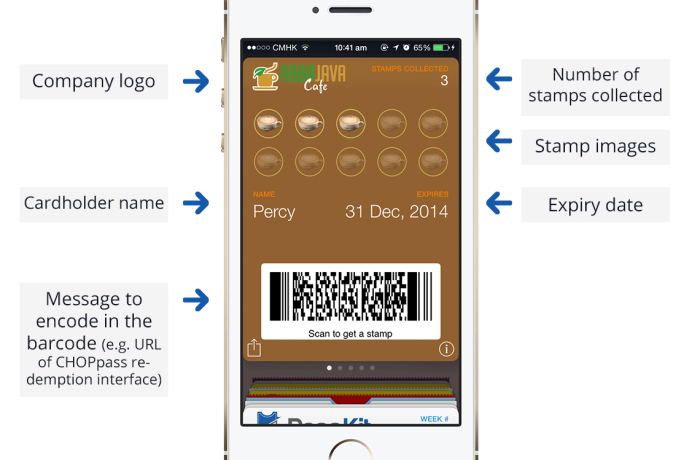 Click on 'Add' to add the stamp card to your mobile wallet. Use a 2D scanner or a scanning app (we recommend Manatee) to scan the barcode. Add stamps by clicking on the + button and confirm by clicking on 'Send Update to Pass'. Your pass will be updated to reflect the changes. Ready to create your own digital passes? Sign up for a free account or select from one of our tailor made plans that suits your business needs.